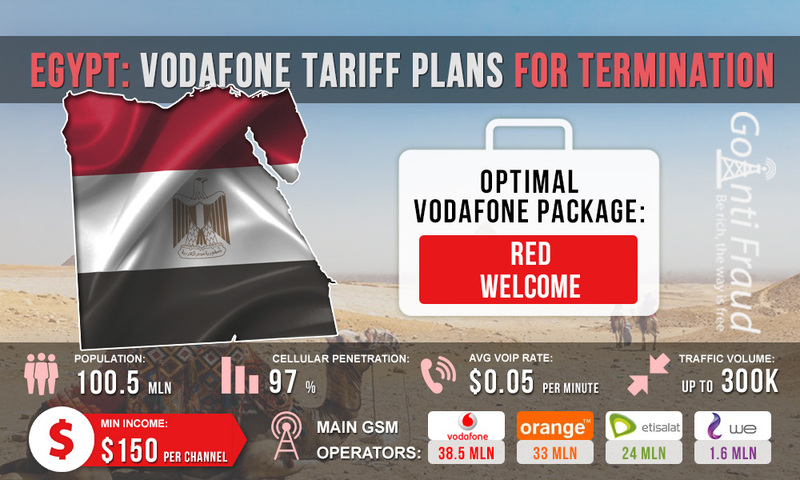 Vodafone is the largest mobile service provider in Egypt, owning about 45% of the market. It has excellent coverage over the country, but also quite high rates for calls. For traffic termination, one needs cheap mobile communications inside the country. If desired, you can choose a voice services package from Vodafone with favorable conditions for the subscriber. RED WELCOME. It provides 1000 minutes for calls to any network. To activate the service, you need to pay $5.4. RED CLASSIC. It provides 2000 minutes for calls to any network. To activate the service, you need to pay $11.4. RED HIM. Unlimited calls to any network. To activate the service, you need to pay $23. RED TRAVELER. Unlimited calls to any network plus 35 GB of mobile Internet traffic. To activate the service, you need to pay $34.3. RED WELCOME will be the best solution for working in the termination business. It will provide the minimum cost per minute of call of $0.005. With average voip rates egypt of $0.04 per minute, you will earn at least $100 from one gateway channel (with the equipment operating for 5 hours a day). You can terminate more minutes per day using multi-channel equipment, thereby increasing your profit.